No more spreadsheets! Centralise your data with Salesfundaa ERP system for Sales and Service. The number of spreadsheets your employees use daily can be alarming. They use a variety of spreadsheets for financial budgeting and planning along with storage of customer contact dataand critical business information. Spreadsheets have a wide application to store payroll and employee information, sales data, inventory details, project timelines and more. Some of the most important processes are tracked in Excel sheets. Despite these facts the Salesfundaa ERP software for sales and service finds a leverage advantage to spreadsheets. And why not. The Automation and ease of operation for different aspects in business management system is an any day convenient and a life saving time saver. spreadsheets put business at risk. 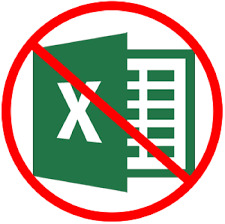 While spreadsheets are initially convenient but not a secure medium to store the privacy of business data and overuse poses a significant risk to the business. Important business data poses a risk of being landed on a disgruntled employees hard drive and being mishandled or worse still may be incorrect formulae may remain undetected for a long time and could be leading managers to make poor decisions. Besides a dispersed information always wastes employees’ time. The Salesfundaa ERP software for sales and service platform has centralised data system which is very essential business management tool that allows to create a solid foundation and gives your business a strong foothold in the market. Most essentially it provides a role-based access to information. Which means only those employees who need to use the data have access to it. And with this access rights they can use the data from anywhere even if they are on the move. Due to the Salesfundaa ERP software for sales and service software’s centralised data disposition the rate of data accuracy because of automated data entry increases. The disposition provides better analytics and business process is streamlined and manual tasks are reduced. Thus, employees spend more time doing essentially sales than figuring out whether they have the latest spreadsheet. The Salesfundaa ERP software for sales and service on the cloud with its centralised data disposition enables seamless integration of data flow from all business systems and proves to be a power packed system for small and medium enterprises with powerful business intelligence for strategic and informed decision-making. Call salesfundaa CRM on 9235 35 35 35 for the best solution if your business is still on spreadsheets and your business management needs the boost of automation.